Turon is one of Filipino favorite meryenda. It is a deep fried banana roll made up of ripe banana (saba), jackfruit and sugar wrapped in a lumpia wrapper. It is available all over the country and is tasty and affordable. Biko is a popular rice cake delicacy in the Philippines. It is made from sticky rice (locally known as malagkit), coconut milk, and brown sugar. The best biko I have tasted was from Marbie’s store in Surigao City. Banana Cue is probably the most popular merienda in the Philippines. It is widely available anywhere in the country. 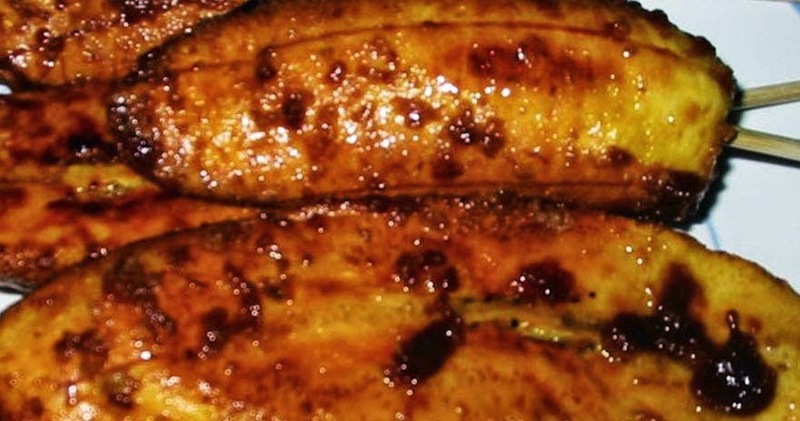 Its is deep fried ripe saba bananas coated with caramelized brown sugar. It is usually skewered after cooking. A sweet potato version is called camote cue with the same process of cooking. Salvaro or Cassava Crisps is a round-shaped delicacy made from grated cassava, fried and then drizzled with caramel on top. Tinagtag is a native Maguindanaoan delicacy made of ground rice and sugar. It is available in some parts of Mindanao. The best known maker of tinagtag is in the town of Pikit in North Cotabato. 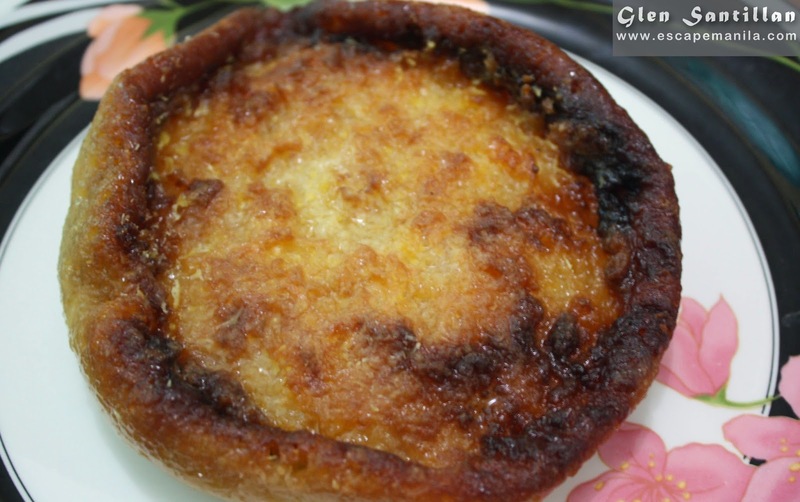 Budin is a type of cassava cake and is a popular kakanin in Quezon Province. The most popular place to buy Budin is at Calle Budin in Tayabas. A native delicacy of Leyte which is made with sweetened mashed giant taro called talian and packed in half of a banana leaf-covered coconut shell. The town of Dagami is the most known supplier of delicious Binagol. Kalamay / Calamay which means “sugar”, is a sticky sweet delicacy that is popular in many regions of the Philippines especially in the Province of Bohol. It is composed of coconut milk, brown sugar, and ground glutinous rice. Traditionally it is put inside a coconut shell. Moron is a native delicacy from Leyte. It is a sweet choco-filled sticky rice cake with smooth texture wrapped in banana leaves. It is widely available in Eastern Visayas especially in the Province of Leyte but the town of Dagami has the best Moron. 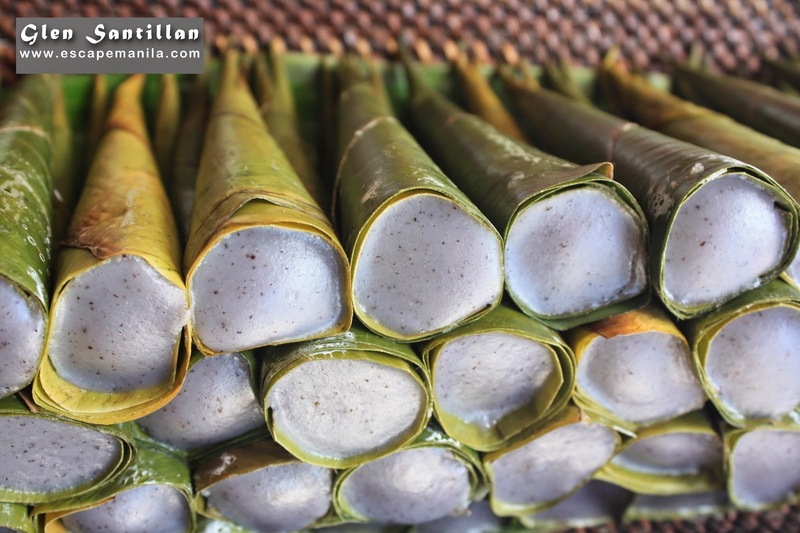 Sayongsong is a cone shaped local delicacy made from ground purple sticky rice mixed with ground regular rice and is cooked with coconut milk and sugar then wrapped in a banana leaf. It is widely available in Surigao City and Marbie’s Store near Mabua Pebble Beach sells the most tasty sayongsong. Digos City is known for its rice Bibingka and the best maker of this Pinoy favorite merienda is Mers. Mers sells different types of kakanin and their best-seller is their rice bibingka. It’s defnitely a must-try when visiting the city of Digos in Davao del Sur. 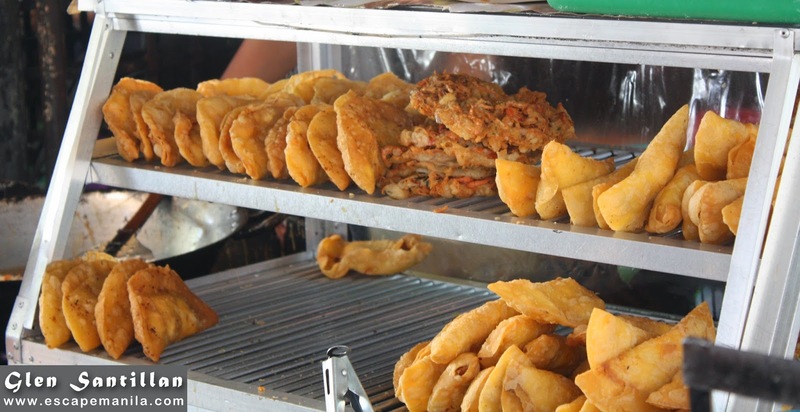 They say that a visit to Vigan will not be complete without tasting its famous empanada. It is usually made up of grated unripe papaya, egg and sauteed Vigan longganisa then wrapped with a rice flour and deep fried. Suman is a traditional Filipino rice cake that is usually made from glutinous rice cooked in coconut milk and sugar, wrapped in banana leaves and then steamed steamed. Aside from using glutinous rice, some variations also use root crops such as cassava. There are numerous varieties of suman, with almost every town or locality having its specialty. Is is also popularly called “budbud” in the Visayan and Mindanao region. Tsokolate on the other hand is a popular drink in the Philippines made from a local variety of cacao commonly called tablea. It is a thick chocolate drink usually served with milk and sugar. These two are best paired together. 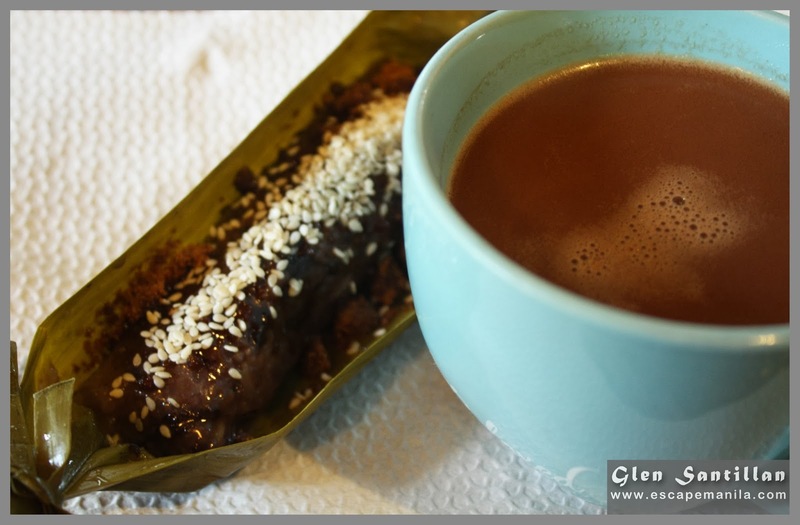 A hot chocolate and suman for breakfast or snacks is superb! Did I miss something? Please comment below.